It’s crunch time! Scrambling to finish all of my gift shopping and last-minute errands in the precious little time that I have between work, holiday parties, freak snowstorms, and all-important reality television watching. I’ve been wearing this sweater with just about everything lately. It’s one of those rustic wool pieces that wards off cold weather like a sheet of Teflon. The sweater is amazing! What a timeless piece, and it looks like such great quality! You look beautiful, as always! Fantastic outfit, darling E. I am crazy for your bag! Gorgeous! Wonderful colour-scheme! Been reading your blog sometime and I must say I honestly don't understand how you manage to look so fantastic all the time…and you pull off things a lot of people couldn't! truly inspiring! omg, i'm in love with your jacket, bag, and fur-trimmed booties. and everything else too!! you have such great style and i love this comfy warm outfit. I love those boots! You do shorts very well! These are lovely. I'm just catching up but this one took my breath away. Awesome colors and photos. You always look fabulous! Looove the different textures here. Perfect ensemble! Very elegant and chic. The boots are to die for. outfit is FAB! love the boots and shorts. Ohhh…those shoes are So beautiful. And the colors of whole outfit. I really, really like it. I love the pop of color on your coat. Those shoes, my dear, those shoes – wow! I love those boots–they are so (surprisingly) versatile! And the sweater and coat are definitely "forever" pieces. Successful shopping to you! i LOVE tights + shorts. such a great look! That's such an elegant and gorgeous coat!! That sweater looks like the dream sweater I have in my head that I need to obtain. Gorgeous with the coat and very unexpected as always with the leather shorts. Obviously those little leather shorts are to die for…but particularly envious of that BAG…looks like the perfect tan leather bag. What a great sweater. I am a big fan of the Aryan cableknit sweater, love the vintage '60's version of it, and yours reminds me of that. Classic and warm and wonderful. Ok, now I think I want my own. In charcoal grey wool. Big like a dress. Thanks for the inspire! That sweater looks fantastic on your and frankly, I don't understand how someone can look so great in a frantic season like this? Deliriously in love with this look — it's so chic it's almost maddening. I've been collecting cold-warding-off sweaters and this is a beaute. But the shoes….bestill, my heart. Many sighs. You look great. That coat is fabulous! I have a sweater just like that. It's super warm and hard to give up when it's freezing outside. you have camel coat perfect. i adore. good luck getting everything ready, the holidays always sneak up on you! Very chic look, darling E! Oooh I love that camel coat!! i want one! 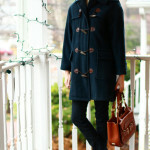 Loving the camel coat – just darling! You're looking great in that camel coat! The sweater and leather shorts combo is so good. im soooo in love with that sweaterr ! leather shorts are awesome too ! I love everything camel, the boots are my fave! Come enter my giveaway!! Oh, man, that sweater is GORGEOUS! I would have that in regular rotation as well! This camel look is divine! Especially love the coat and shoes! at first sight you outfits seem so 'good-girl', but if you look closer you see the scharp edges! Love your style!